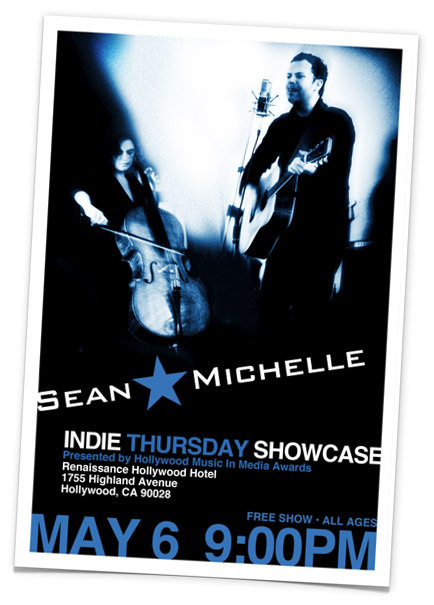 I’m happy to announce that Sean & Michelle will be playing the “Indie Thursday Showcase” presented by Hollywood Music in Media Awards on May 6 at 9:00pm. We played this venue for the ASCAP EXPO recently and can say that it’s a great vibe with great sound. Wanna come? We would love to see you there. It’s going to be a fun show. Food: Great entrees, appetizers and more! If you could pass on the info once the song is available for download, I’d love to pass it on to folks. Take care and thanks for the reply! Very cool Sue… Will do!